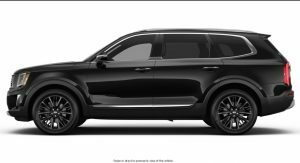 Kia has just released the online configurator for the 2020 Kia Telluride and it perfectly showcases just how many guises the Telluride can be ordered in. Open up the configurator and you’re immediately given the choice between the entry-level LX model, the mid-range S and EX versions, and the range-topping SX. From there, the configurator allows you to select a range of different paint scheme. Curiously, the configurator only shows images of the Telluride SX, all lesser models feature a placeholder image. Speaking of the Telluride SX, it can be painted in Dark Moss, Snow White Pearl, Everlasting Silver, Gravity Grey, Black Copper, and Ebony Black. Sadly, those looking to buy the SX don’t have any even remotely colorful options to choose from. It’s a similar story with the interior as there are only four different configurations offered for the Telluride SX. While the configurator itself is lacking some basic functionality, it does show a series of the optional extras available for the SUV. These include a $155 cargo cover, $210 carpeted floor mats, $310 cross bars on the room, $310 illuminated scuff plates, and a $450 interior light kit. A tow hitch with harness can also be optioned for an entirely reasonable $475. 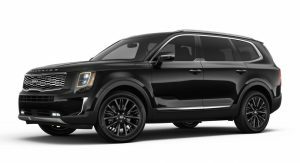 The most expensive option for the Telluride SX is the $2000 Prestige Package. This pack includes Nappa leather, a premium headliner, Head-Up Display, rain-sensing windshield wipers as well as heated and ventilated second-row seats. 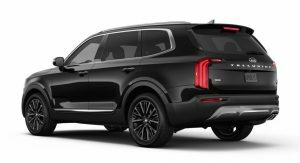 If you spec out a 2020 Telluride SX, you can get its price up to $50,775. Fortunately, there are many more affordable variants offered including the entry-level LX which starts at just $31,690. 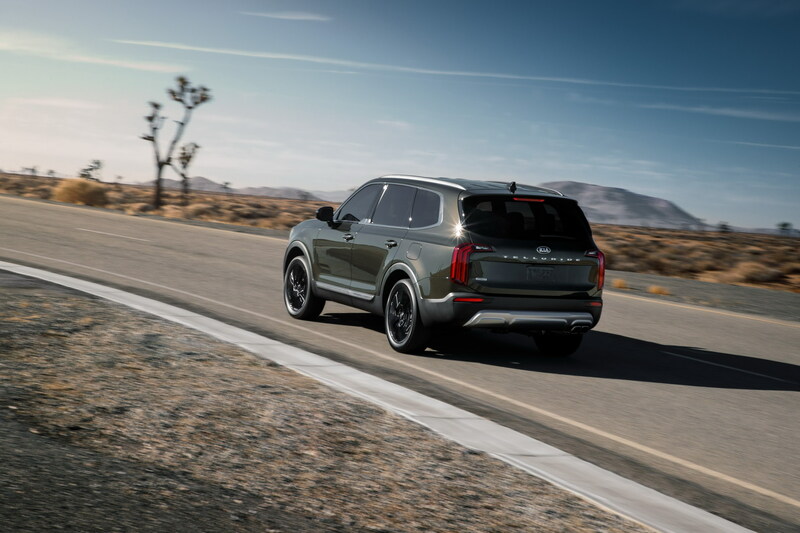 All 2020 Kia Telluride models feature a 3.8-liter V6 engine delivering 291 hp and 262 lb-ft (355 Nm) of torque. 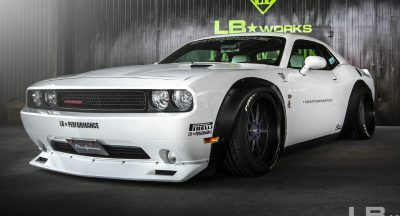 So, they’re keeping the Telluride text on the hood? it’s not uncommon for automakers to do that, but okay. You really can’t beat the price. Best one in the segment next to its sibling. Really considering this as my next vehicle. The Telluride is money. Especially in top trim, with the green paint, and black wheels. I will admit though. I strongly dislike when manufacturers interrupt the long glass look on their panoramic roofs. I know it’s a nit, but it’s a deal breaker for me. WHERE DID YOU SEE GREEN PAINT? I SEE WHITE, THREE GRAYS AND TWO BLACK. Go get your eyes tested. 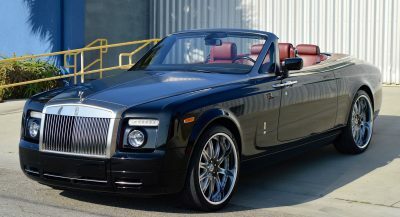 what is so special about this not saying it looks bad but, If i had a choice, I’d choose the Hyundai Palisade over this. Nothing special. I just prefer the looks of this over the Palisade. Just a preference. Kia is doing things right! Pricing is just excellent. Even the base model has leatherette seats, nice wheels and a lux feeling. 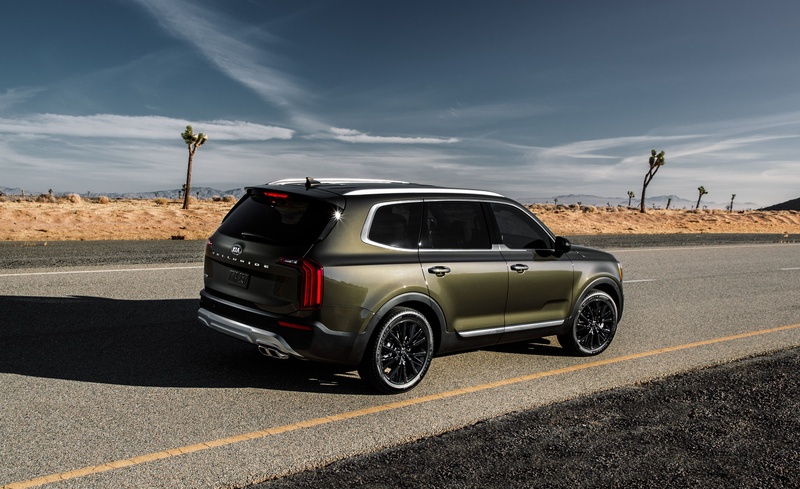 Loaded Telluride SX or the base Cadillac XT6? Think I’d rather have the Telluride. I agree 100% on this. But something tells me a non auto enthusiast buyer would rather drop 53k on a (well kitted) base Cadillac XT6 vs 50k on a reeeally nice Kia. Regardless of the quality of their products, Cadillac has more prestige. For any given day, that’s a no brainer. Unlike other pricy Hyundais/Kias that don’t seem authentic or a decent value, I have a feeling that this thing is going to sell very well. IT LOOKS LIKE A GM VEHICLE. NO COLORS JUST NEUTRALS TO CHOOSE FROM. HOW DREARY. How is that Kia’s fault? Blame us boring buyers that don’t buy cars in “fun” colors anymore. They’re just picking colors that they know will sell. Besides, it’s not an RCF or M4 that actually look good in bright orange or yellow respectively. Also, please lmk what GM model this looks like. With the way GM is nowadays, they wish they could have a car that looks this good. Well, for starters , the headlights look like a weak copy of the five year old designed GMC Yukon. So there’s that. And the Hyundai version of this looks very much an amalgamation of different GM trucks all wrapped up into one. 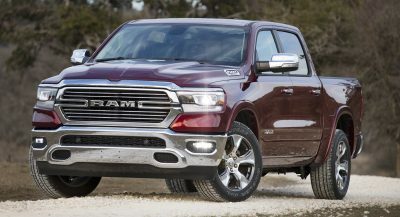 This and the Ford Explorer, in their top trims, beat out virtually all of the entry-level luxury offerings from Audi, Volvo, Acura, Cadillac, and even Lincoln’s new Aviator in design, equipment, tech, etc. They’re both super premium and have the physique or presence of a Range Rover or an X7, or the poor man’s version of that. I’d really like the Telluride more if it didn’t have the grey plastic cladding. I get that it’s for the “rugged” look, but even the Sorento in its SXL trim gets body painted cladding. 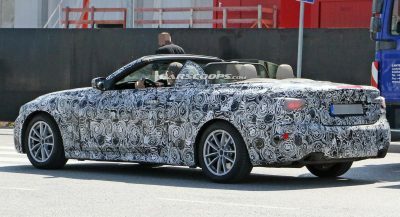 He still over-sees the design coming from Kia (and Hyundai) so the car’s designs still have to get his approval before they go to production. Previous PostPrevious How About A 1988 RWB Porsche 911 To Brighten Up Your Weekend?